In 1925, the hotel was purchased by the Atchison, Topeka & Santa Fe Railroad and operated as one of the famed Harvey Houses. Hotel/Resort Fees & Taxes: Additional fees and taxes may apply. Pet Policy: Service animals allowed: Yes. Pets allowed: Yes. Restrictions: Maximum amount: 40 lbs. Fees: $50 per night. 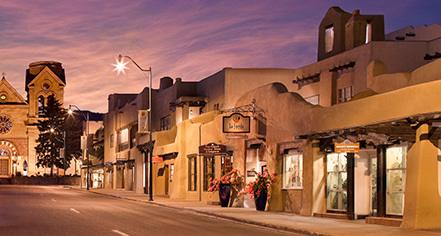 La Fonda is a Santa Fe landmark, just steps away from history and art museums, a variety of galleries and shops, historic churches and, of course, the Plaza. 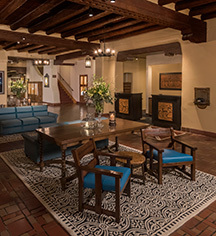 The historic inn’s Pueblo-style architecture features thick wood beams, latilla ceilings and carved corbels. Learn more about the History of La Fonda .